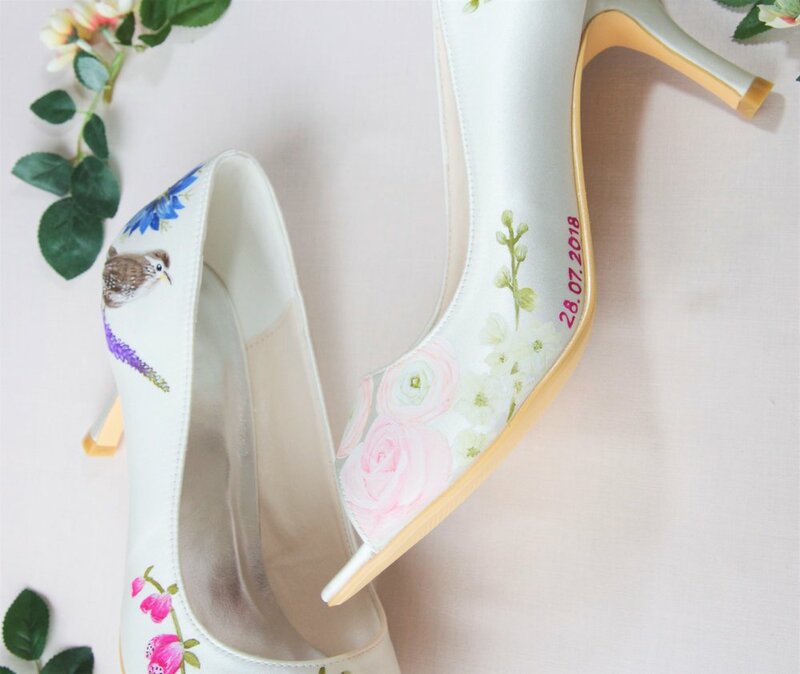 We have had a lot of love for our personalised shoes this wedding season, and when you can customise the flowers surrounding your initials, or name you can see why! At Elizabeth Rose London, we believe that shoes are the perfect finishing touch, and are the perfect focus for the finishing flare. With a pop of flowers you can really bring them into a dimension of their own. It doesn't matter if you have a long wedding dress planned, the beauty of our personalised shoes is that you know they are there, and were designed just for you and your wedding day! With this in mind we have curated some of our popular personalisations, in order to give you some inspiration for your own design. Date: Such a sweet and popular finishing touch is adding your wedding dates to one or both of the shoes. If you're having more than one ceremony you can add one on each shoe, giving equal weighting to both days. The script can be placed anywhere on the shoe, along the side, nestled in a flower petal, or on the sole of the shoe. Initials: Monograms are always a gorgeous touch, they can be as discreet or as bold as you want. The most popular choice is the bride-to-bes new married initials, or a mixture of the bride and grooms initials joined together, we can sketch something up using your letters and a variety of fonts, or work from your own handwriting, so don't forget to mention this when you get in touch! Married Name: For the ultimate statment why not have your new married name in full script on your wedding shoes? Choose your font and placement, and our designer Sophie will perfectly re-create it on your shoes, creating the perfect keepsake from your wedding day. Now you have been inspired by our previous brides, why not start design your own pair of shoes with our design Sophie. Simply fill out the contact form with your initial ideas, and Sophie will develop the perfect design with you.